Shreve McLaren Archer III, MD, known to his many friends as "Mac", died June 18, 2007 at Stanford Medical Center. He was 58. Complications from the treatment of leukemia was the cause of Mac's way too early death. Mac at the Monterey Historics in 2000. He raced his 427 Cobra for 22 years in California historic events. Here he gives a young race fan the thrill of sitting in the driver's seat. Mac also raced Can-Am cars, winning the "AutoWeek Vintage Motor Racing Challenge" in 1993 driving the ex-Roger McCaig McLaren 8C-Chevrolet. His latest automotive project was the restoration and race preparation of the ex-Gary Wilson "Sting" Can-Am car. 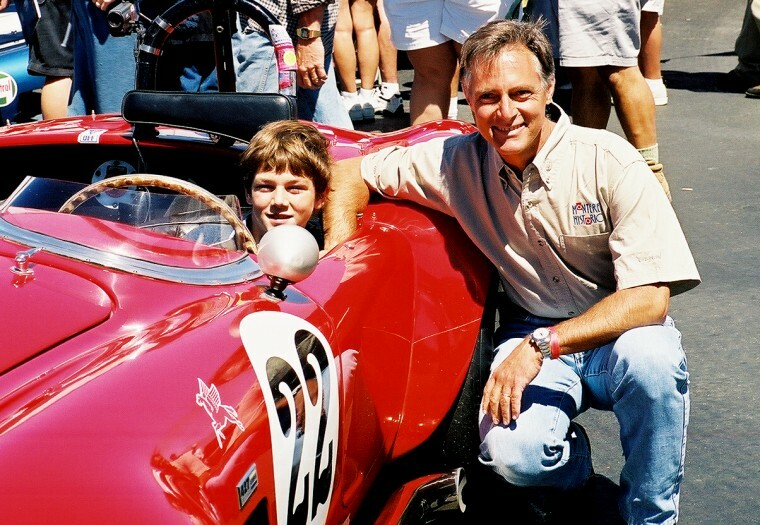 "While the Sting was his last personal CAR project, he was more recently the designer of the "First Seat" infant car seat ( due to be on the market in the near future), and a custom seat and head surround for Jimmy Castle's Lola 222 BB Can-Am car (expected to be on west coast racetracks next year). And not to forget that he was also the medical consultant for the design of the "extractable seat" used in all current F1 cars." Before beginning his career in historic racing, Mac raced motorcycles in California and Florida. A Pediatrician, Mac practiced medicine on the Monterey Peninsula for decades. He's survived by his wife, Kim, and his sons Damon James Archer and Shreve McLaren Archer IV.